My name is Jim Van Rassel, owner of NEW TREND OPTICAL. We are located at 2550-B Shaughnessy Street in Port Coquitlam. We have been serving the Tri-City area now for 30 years from our present Port Coquitlam location. Eyeglasses and sunglasses, prescription or not, are the most noticeable piece of functional jewelry one wears. 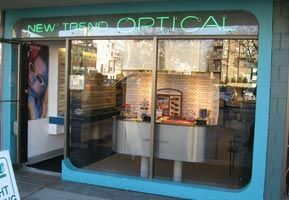 We at New Trend Optical do our damndest to stay away from the "cookie cutter" concepts and looks as much as possible. With our ever-increasing demands on ourselves, your eyeglasses or contact lenses should be a part of you that helps in achieving your goals. And hey, someone complimenting you on how great you look in your eyewear doesn't hurt either. Some of the other services we provide are eyeglass repairs, including soldering, sight testing, for updating your prescription in-between your full medical eye exams. We carry multiple lines of fashion and sports sunglasses, and, of course, if you have any questions regarding your visual needs, please pick up the phone or drop us an email and ask...any time. Learn more about Jim Van Rassel here.